EXCLUSIVE UPFRONT DIGITAL RELEASE. Since co-founding the Rastermusik label with Frank Bretschneider in 1996, and later merging with Carsten Nicolai's Noton imprint in 1999, Olaf Bender has been the quieter of the three Raster Noton figureheads. 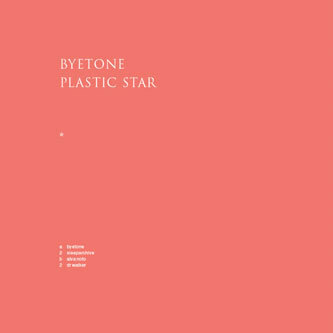 That only serves to make his productions all the more precious, and 'Plastic Star' will certainly have you wishing he'd come out of the shadows a little more often. It's one of the more dancefloor-compatible tracks to tap into the signature Raster Noton sound, reconfiguring those distinctive post-clicks 'n' cuts microsonic pulses and waves into something more than a little bit like Minimal techno. There's even a smattering of melody towards the end, with an upsurge in fax machine interference tuning itself into a pentatonic riff. Next, Sleeparchive's remix renders the track that little bit more three-dimensional, adding a more spatially dynamic feel to the beats, whilst still cushioning them in that fearsome digital background noise. The end result is a kind of halfway point between the caustic, cavernous minimalism of Pan Sonic and the more sanitary, functional output of the Minus label. In any case, it's mighty. Next, Alva Noto brings some hefty squashed rhythms to the table, preserving all the key elements of his own unique sound whilst embracing the - dare I say it - 'club' feel of the EP. Probably the most conventional retake on the source material is the Dr. Walker remix, which although still very much steeped in the coarse, reductive tone of the original shows up with a few ornamental production details, and a drum sound that... well, sounds like an actual drum sound. Mighty stuff - ESSENTIAL PURCHASE!